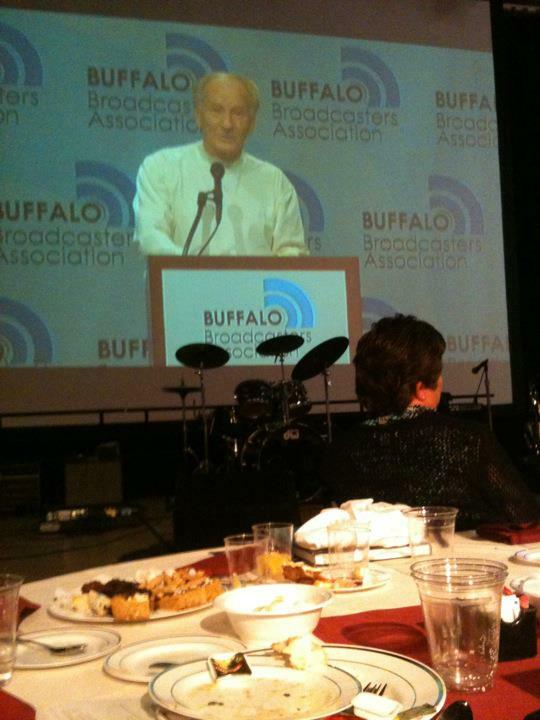 Tonight was the Buffalo Broadcasting Hall of Fame Awards. 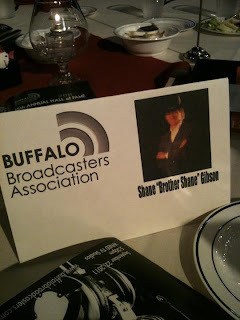 Our friend Shane, Brother Shane was being honored and it made Howard and me happy and proud to sit with him at his table. At the top of this post is Shane on the video screen making his acceptance speech. It was an insane speech, wonderful. It started out slow and then built, and built. Like Mark Antony's funeral oration in "Julius Caesar." Like Pennario playing the mighty Toccata from Ravel's "Le Tombeau de Couperin." Where was I? 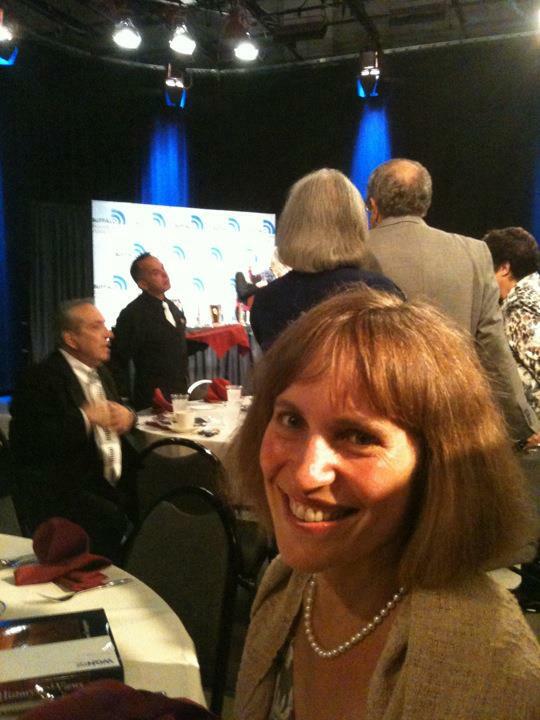 Back to the Broadcasting Awards. Here is a picture Howard took of me at the table. That is where I usually am, at the table! 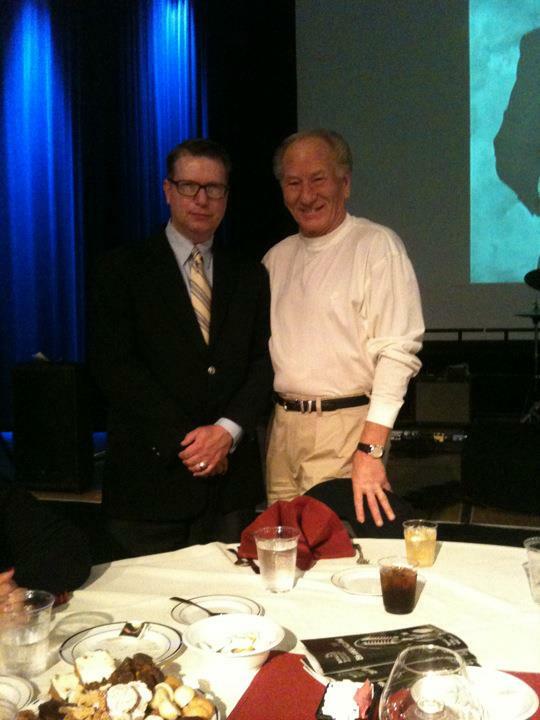 Here is Howard and Shane. You can read about Shane and hear clips of his mighty voice in action on our friend Steve Cichon's Web log. I kept thinking about when Pennario came home to Buffalo to accept an award from the Buffalo Music Hall of Fame, which was when I met him, yikes, four years ago. There were some similarities between the two situations. I was remembering Pennario making his speech. Luckily Pennario was not knocking back shots of tequila and disappearing every two seconds, which was what Shane was doing. We were getting so nervous! We kept worrying that Shane would be missing in action when it was time to make his speech. But like Shane, Pennario was kind of nervous and needed a couple of moments alone to get his thoughts together, moments I did not hesitate to interrupt him during. Haha, luckily he did not get mad. I might not be writing this book if he had gotten mad. Shane, Brother Shane is not exactly from Buffalo but he spent most of his life here. He was extremely popular up and down the Eastern seaboard. It is strange but kind of sweet how these people who are used to being listened to by millions can get nervous when it comes time to make a little speech in Buffalo. But it is kind of sweet.